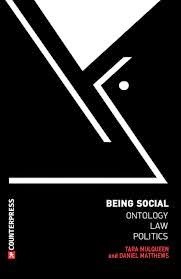 Description: Being Social brings together leading and emerging scholars on the question of sociality in poststructuralist thought. The essays collected in this volume examine a sense of the social which resists final determination and closure, embracing an anxiety and undecidability of sociality, rather than effacing it. Through issues including queer politics, migration, and Guantanamo, recent events such as the occupation of Gezi Park in Istanbul, and theoretical explorations of themes such as writing, law, and democracy, contributors assess how a reconfigured sociality affects thinking and practice in the legal and political realms. With a particular emphasis on Jean-Luc Nancy, whose work brings questions of community to the fore, these essays explore how the consistent ‘unworking’ of sociality informs the tenor and form of political debate and engagement. Table of Contents: Introduction (Tara Mulqueen & Daniel Matthews) Part I: Grounds of the Social 1. The Ground of Being Social (Ian James) 2. Being Social in ‘Law and Society’ (Peter Fitzpatrick) 3. The Meaning of Sense (Pieter Meurs and Ignaas Devisch) Part II: Acts of the Social 4. Being Social Democratically with Jean-Luc Nancy at the Gezi Park Protests (Marie-Eve Morin) 5. The Queer Experience of Singular Finitude (Tara Mulqueen) 6. Labour and Migration in the ‘Suspended Step’ (Anastasia Tataryn) 7. Survival’s Witness: Poetry, Sociality, Community (Patrick Hanafin) 8. On the Law of Originary Sociability or Writing the Law (Daniel Matthews).